Sadly, the 2018 Adult Summer Reading Program has come to an end, but we have plenty of programs planned for adults in the months to come. Join us for the movie I Can Only Imagine where Christian music fans will be thrilled to learn the origin story of a favorite song. Get ready for an afternoon of True Crime. Author, Betty Brandt Passick will be at the library to discuss her book, Gangster In Our Midst. The book describes one of Iowa’s neglected true crime stories of how gangster Louie La Cava, Al Capone’s bookkeeper, descended on small town Iowa. The Book To Movie Club will be watching and discussing the movie Adaptation starring Nicolas Cage and Meryl Streep. The movie is a spoof on book to movie adaptations where an L.A. screenwriter, played by Nicolas Cage, struggles to adapt the book The Orchid Thief written by Susan Orlean and played by Meryl Streep. 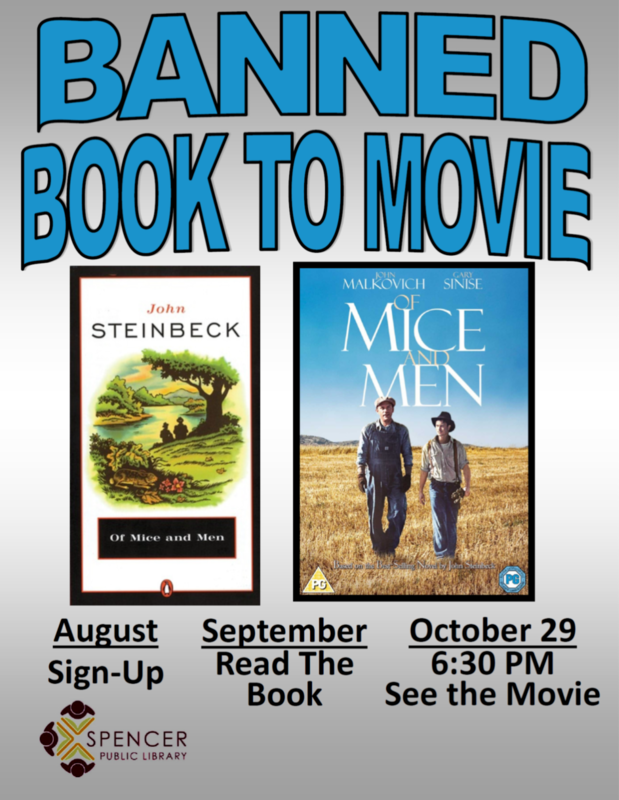 Our next book to movie is in recognition of Banned Book Week. 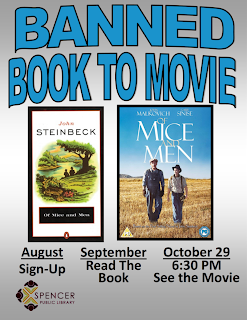 We will take a walk on the dark side and read one of the top banned books of all time, Steinbeck’s Of Mice and Men. We will be watching the movie in October, so sign-up to read the book today.